Born: 1895, St. Clement’s, Ipswich. 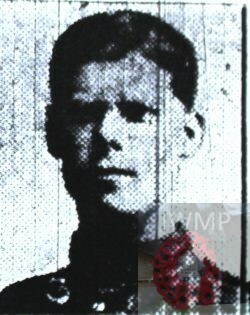 Died: 27th July 1918; age 23; Died of Wounds – Field Ambulance. Served 6 year & 132 days. Residence: 32, Cavendish Street, Ipswich. Employed: Mr. Mercer’s, of Brook Street, Ipswich. Enlistment Details: Date: 8th March 1912; Location: Ipswich; Age: 17 years; Occupation: Butcher for J.W. Moss; Religion: CofE. Next of Kin: mother – Annie Bugg, 32, Cavendish Street, Ipswich. Height: 5ft 9 ins. Service: Embarked – Southampton – Disembarked – Havre. Joined Base Depot – 26th November 1914 – Rouen. Appointed – Lance Corporal – 16th June 1915. Posted to ‘B’ Coy – in the field – 9th February 1916. Appointed – Corporal – 27th February 1916. Transferred to Machine Gun Corps – Corporal – 4th September 1916 – Service Number – 23382. Appointed – Lance Sergeant – 26th September 1917. Home – Grantham 25th October 1917 – Special Course. Promoted – Sergeant – 1st December 1917. B.E.F. 8th July 1918 – Embarked Southampton & Disembarked Boulogne – Joined Base – Camiers – 9th July 1918 – Jopined Battalion in the field – 16th July 1918 – Wounded in Action in the field 26th July 1918. Offenses: 5th January 1918 – Sergeant – Overstaying his New Year Leave from 8.30pm until reporting himself at 11.30pm – 2 days – Severely reprimanded & forfeited 2 days pay. 29th January 1918 – Absent off base from midnight until 11.30pm – 2 days -Severely reprimanded & forfeited 2 days pay. Relatives Notified & Address: Son of Mr & Mrs Bugg, of 32, Cavendish Street, Ipswich. Brother to ARTHUR ALFRED BUGG. 1901 32, Cavendish Street, Ipswich. Frederick was 6 years old and living with his parents & siblings. Henry W. Bugg, 40, a Corn Miller’s Labourer, born Burgh, Suffolk. Annie Elizabeth Bugg (nee East), 39, born Ipswich. Henry Walter Bugg, 16, a General Errand Boy, born Ipswich. Bessie Elizabeth Bugg, 14, a Tailoress, born Ipswich. Edith May Bugg, 11, born Ipswich. Arthur Alfred Bugg, 9, born Ipswich. Frank Walter Bugg, 3, born Ipswich. Percy Oliver Bugg, 1, born Ipswich. 1911 32, Cavendish Street, Ipswich. Fred was 16 years old, a Butcher. He was living with his parents & siblings. Harry, 50, a Mill Labourer. Edith, 21, a Factory Hand. Arthur, 18, a Foundry Labourer. Sidney Charles Bugg, 7, born Ipswich. Fred’s brother Sidney Charles Bugg died in the Second World War. A Japanese PoW at Songkurai No. 2 Camp. He had worked on the Thailand – Burma Railway. Sidney died from Cholera on the 30th May 1943, aged 40. He was a Private, service number 5828171, of the 4th battalion of the Suffolk Regiment. After the war he was laid to rest at Thanbyuzayat War Cemetery, Myanmar.